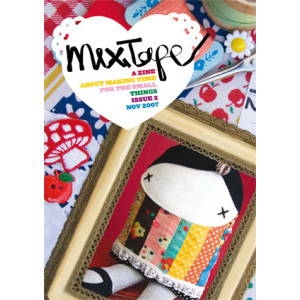 Mix tape (“a zine about making time for small things”) is craft-focused publication from Australia. Packed with how-tos, profiles, recipes, reviews, and thoughts on DIY life, this adorable zine makes a great addition to any craft library. The first two issues include lots of articles focusing on kid rearing and crafts — the balancing act, storytelling art — as well as environmental ideas — greening your beauty routine, green and cheap activities for kids. Some articles also veer away from crafting to ponder “small things.” I especially enjoyed Simmone Howell’s series on paperback books. And as a designer, I must mention: The crisp, clean layout, bright color reproduction and attention to editing makes this zine easy to devour. Check out the mix tape web site for more info. 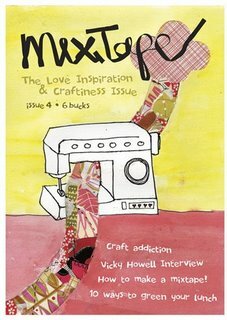 Issue 4 (pictured above) is now available for pre-order and all the issues can be purchased from the mix tape web store.